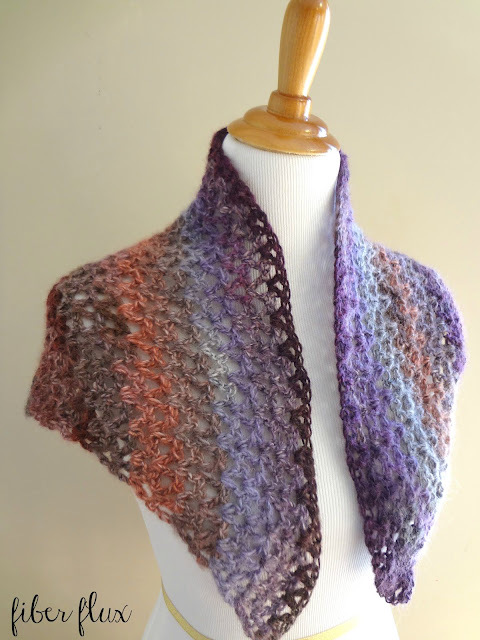 Fiber Flux: Free Crochet Pattern...Kristen Shawl! The Kristen Shawl is both delicate and cozy...a fabulous cold weather accessory. It follows a simple one row stitch pattern and you'll work it up in no time. 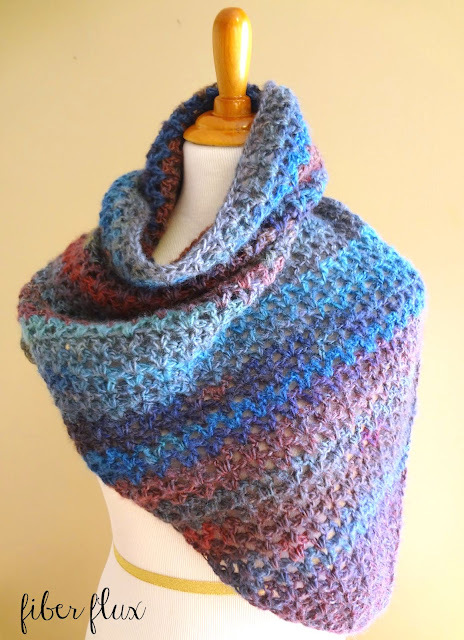 The yarn used here adds subtle self striping, but would be equally pretty with a solid color too. Included with this pattern are instructions for sizing for a regular sized shawl and a smaller "shawlette." The shawl was named after a dear reader and fabulous stitchy friend, Kristen. She contacted me through Ravelry recently and realized she had made a "mistake" while making the Butternut Squash Neckwarmer (click here for pattern). While making it, she added an extra stitch at the end of the row and ended up with a triangle...such a neat little discovery! She kindly asked me if I could whip up a pattern and here it is! Thank you Kristen for your extra stitch...this one's for you! Note: this shawl pattern is extremely customizable, the measurements provided are just to give you an idea. If you want yours to be longer, just keep going! Some people like a smaller shawl without all the bulk, while others like a longer shawl with lots of drape...just work it until you get the size you like! Row 1: Turn, ch 3 and work (dc, ch 1, dc) in each of the chain 1 spaces from the previous row (center of each "V"). At the end of the row, finish with a (dc, ch 1, dc) in the last space (ch 3 turning space). Finishing: Weave in the ends and you're ready to go! You are so welcome! Thanks for your kind words too! Thanks and you are so very welcome, my stitchy friend!!!! I Love it. So much! I was able to make the Butternut Squash Neck Warmer as a gift for a friend and I just loved it! Thank you for the pattern. Now, I would also give this Kristen shawl a try. This looks so nice! I might have to make one or two for Christmas presents. Thanks! The two shawls shown above are already designated gifts too! Yay for completed gifts! This is beautiful! I was thinking of making my sister a shawl for Christmas - she works from home and recently moved from So. Cal to Denver so I wanted to make her something keep her warm. This will be perfect! Thanks so much! I'm sure she would love it! I made the Butternut Squash neckwarmer exactly like the pattern & love it! I'm going to try this with Amazing, too.both your patterns & yarn selections rock! Glad you liked it! Thanks for your kind comment too! This is beautiful. I love shawls, but this is the first "Shawlette" that I have liked. It's so practical too! I can see I'm going to have to make several of these. Thank you so much for sharing the pattern. hi there, this looks really beautiful. i am attempting to crochet this, but mine looks kindof funny so far, and im confused. when you say, dc/ch/dc in each of the chain 1 spaces from the previous row (center of each "V"). ...do you mean we dc/ch/dc in every stich in the back loop only? Nope, I just mean in each space, so you would do a dc, ch 1, dc in each space that made a V shape from the previous row. Hope that helps! Just found this shawl pattern and love it! Thanks so much for sharing it for free. I love your patterns! They make up so easily and look gorgeous! Thanks!! You're welcome and thank you so much for your kind words! Thanks for this pattern....I crochet for the Pink Posse of GA; childhood cancer; and anyone I know needs a special "yarn" hug. This will be a great addition to my "hug" patterns. This will be a wonderful addition to our Prayer Shawl group at church. These are made and given to those who need a little help and warmth in there lives. Sounds like a wonderful thing you are doing...the world needs more people like you! I made the shawl with 3 skeins of Amazing yarn. It went very quickly and is very pretty. It seems to be kind of long and pointy in the back on me. Do you have any suggestions on how I can make it wider without making it longer in back? The shawl increases by one "V" per row, so if you want to make it wider without making it longer, you could always increase by two "V" instead in just one per row. It starts from the bottom point and works its way up, increasing into a larger and wider triangle as it grows. The 7 starting chains make that beginning triangle point. Hope that helps!! I just finished one of these in the Amazing Yarn "Violets" colorway to go with a wine-colored dress I'm going to wear to an outdoor wedding in March. It's so pretty, and I will stay warm and still look nice at the wedding. I wanted mine a little longer so I could wrap it over my arms, so I actually used 3 1/2 skeins. That sounds absolutely gorgeous!! March weather can be tricky, that was definitely a good accessory choice! I love this shawl pattern. I am using some on-hand bulky weight wools I have left over from making fibre scarves and amongst them are some textured yarns which are adding interest to this wonderfully fast, easy pattern. I often play bridge with some ladies who are fresh air fiends and I am always in need of a warm cover up. This is it! Thanks a lot for sharing. You are so kind. The bulky weight shawl sounds so cozy! Sounds really pretty too, enjoy wearing it with your friends...sounds like fun! Love the pattern-so easy!! I am using red heart eco-cotton yarn and its beautiful so far! Thanks! I love being able to "shop" in my yarn stash too! Thanks for your question! All that means is that when you finish the previous row, and go to begin the new row, chain 3 and turn (flip the piece over). Then continue with the rest of the row. Do this for each row. I enjoyed making your shawl pattern. When finished I crocheted a lacy edge all around. The top edge I finished with 1/2 double crochets because I liked the straight front. Your answer to someone sho wanted a larger shawl to increase 2 V's at each end. I am going to try that. Thanks, it is easy and goes so quickly. That sounds gorgeous with the lacy edge, bravo!! So easy. I love it! I can't wait to finish so that I can be warm on chilly mornings! Thanks for sharing. Crystal clear directions!!! So easy and pleasurable to do!!! Thanks so much!!! I've just gotten started, shawl looks great already, and I'm looking forward to making many Kristen Shawls for my Prayer Shawl group. This is working up fast, there are no complicated directions to follow, and your directions were a real snap to follow. Just what I was searching for. Can't thank you enough - and the pictures were an incentive to get started - they looked so good. 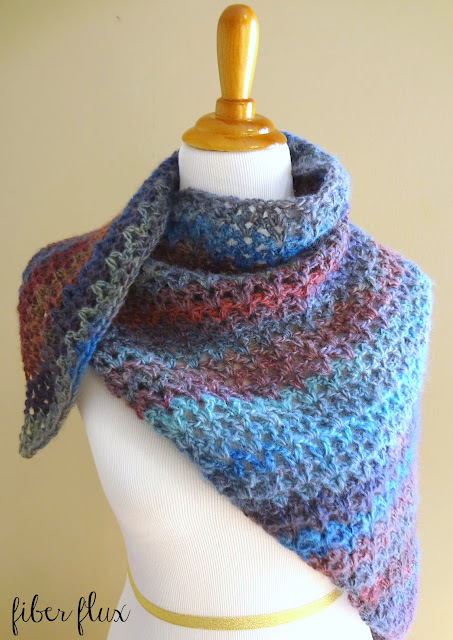 what were the lion brand amazing yarn colors you used for each of the shawl and shawlette ? I'd also like to know which colorways of the Lion Brand Amazing yarn were used above. I've tried in vain to discern the colors from your two shawls above with online color samples. Many thanks. Love this! Lucky me I just bought a bunch of Amazing yarn @ the Lion Outlet yesterday. It's a "gotta make this" item!! Thank you so much for the pattern. Beautiful shawl. I love my shawls rectangular 24 x 60 inches. Amazing Yarn would be gorgeous in this pattern. THANK YOU for the fantastic shawl pattern!!! I'm going to male this for a friend of my daughter to thank her for all the help she has given to our family. She is always there when needed and is a fantastic person. I love your patterns! I just finished the Ocean Air Scarf and I LOVE IT! I'm working on some fingerless mitts with the same scallop pattern to go with. One question about the Kristen scarf, approx. what weight is the yarn you used? My local yarn shop doesn't carry Lion brand. the yarns i do have are: red heart, caron simply soft, lb heartland. which would be best to use for the kristen shawl? I only have solid colors. Great pattern. Thanks! I added an edging of 2 hdc in each space all the way round (4-5 hdc in each corner). Came out beautifully. Thank you for sharing this pattern. It's a super one evening, last minute present! I made the Kristen shawl in Amazing "Vineyard" for a Christmas gift and it turned out lovely. I used 4 balls of yarn for a bigger shawl. 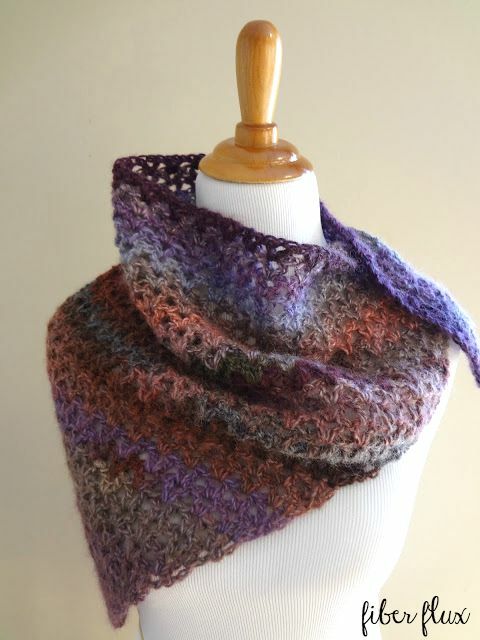 Can you tell me which color of Amazing you use for the longer shawl -- the one with the purples, oranges and browns? I can't find a color match on the Lion Web site. Thank you. I'm having a hard time understanding where to place the stitches to make the V's. I'm really looking forward to making this shawl for my aunt. Just wondering which colour of the lion brand amazing yarn you used in the shawl shown in the picture? thanks so much for sharing. Your patterns are great. Love them.